Western Province scored four tries in their 28-19 win against Griquas. Western Province beat Griquas 28-19 at Florida Park in Cape Town on Sunday to win the inaugural Provincial Rugby Challenge title. MARIETTE ADAMS reports. Western Province beat the Blue Bulls 28-24 in the second semi-final of the Provincial Rugby Challenge. Griquas booked their spot in the final of the Provincial Rugby Challenge with a 33-21 victory in Mdantsane. Western Province beat the Blue Bulls 28-24 and Griquas defeated the Golden Lions 33-21 in the semi-finals of the Provincial Rugby Challenge in Mdantsane on Sunday. 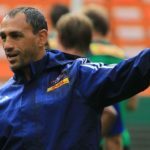 Michael van der Spuy has retired at the age of 26 due to repeated head injuries. The Golden Lions XV, Griquas, Western Province and Blue Bulls advanced to the last four after clinching wins in their Provincial Rugby Challenge quarter-finals. Junior Boks star Juarno Augustus has been named in Western Province's match 23 for Sunday's Provincial Challenge Cup quarter-final against the Cheetahs. The Golden Lions XV beat the Blue Bulls 55-49, while there were also Provincial Rugby Challenge wins for the Pumas, Griquas, Sharks XV, EP Kings and Western Province.